These delicious oat biscuits are sold commercially under the name of Hob Nobs. They are seriously easy to make, and it's impossible to just eat one! Cream the softened butter and sugar together until smooth and a bit fluffy. Stir in the milk, syrup and bicarb. Mix in the flour and oats. The mixture will be quite stiff and dry, so you may have to finish mixing by hand. If you are using a cutter to shape your biscuits, roll the dough out onto a floured surface and cut the shapes. Otherwise, divide the dough into 24 balls and squash them flat. Place them on a couple of baking sheets lined with greaseproof paper, leaving plenty of space between each one because they will expand during baking. Preheat your oven to 130°C (266°F) if it's a fan oven, 150°C (302°F) if not. Bake the biscuits for 25-30 minutes, turning them round once to get an even bake. The biscuits should feel firm when they are cooked, and should not be too coloured. Let them cool on a wire rack. Store in an airtight container. The video above is from the Keef Cooks YouTube channel. 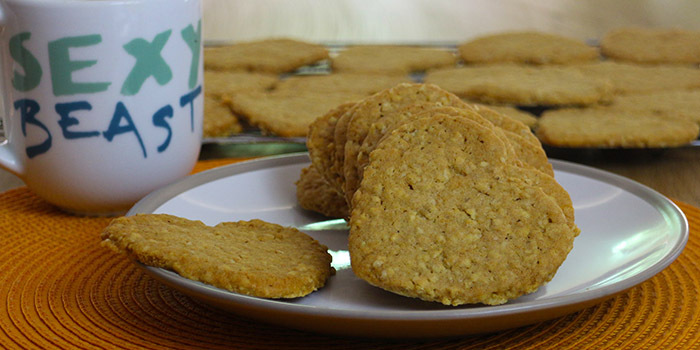 Click here to see the video recipe of Oat Biscuits - HobNobs on YouTube. Prep time: 10 minutes. cooling time: 15 minutes.